Cascade was founded in 1911. Many historical figures have been through Cascade and called it home, including Lewis and Clark, Charlie Russell and Robert Atkinson. 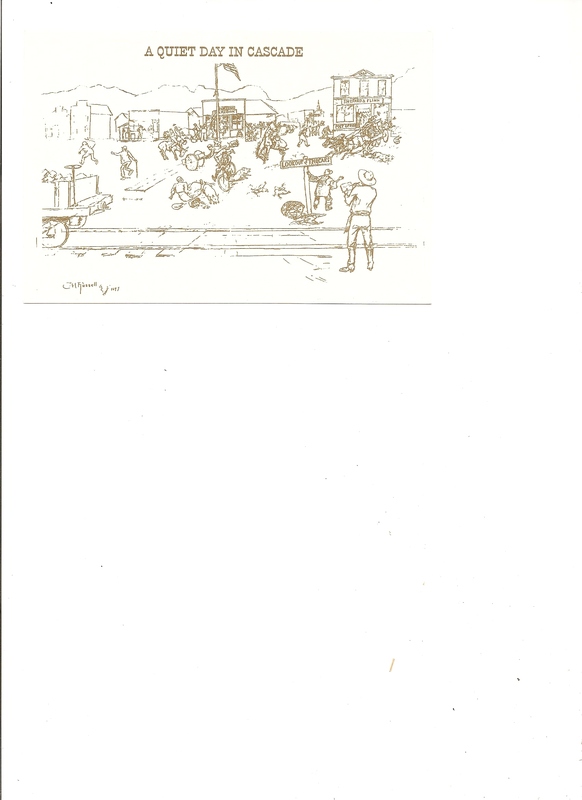 Charlie Russell did a pencil sketch called, “A Quiet Day in Cascade.” Copies are available at Cascade Town Hall. Much of Cascade’s history is printed in the book, “Mountains and Meadows.” It is available for sale for $15.00 at the Wedsworth Library. An original Charlie Russell pencil sketch that the Town of Cascade owns. Atkinson Park was donated in honor of J. Robert Atkinson. He moved to Cascade as a young man to be a cowboy. While visiting his mother and brother in California during the gold rush, his 6-shooter accidentally went off, shooting Robert in the face and blinding him for life. While trying to learn to read Braille, he became frustrated and created the Braille system that is used today. He also founded the National Braille Institute, located in California. After his death, Mr. Atkinson’s widow had the park built in his honor.